One of Carolyn Massey's suave boys from Dungeness. Image courtesy of Dazed Digital. 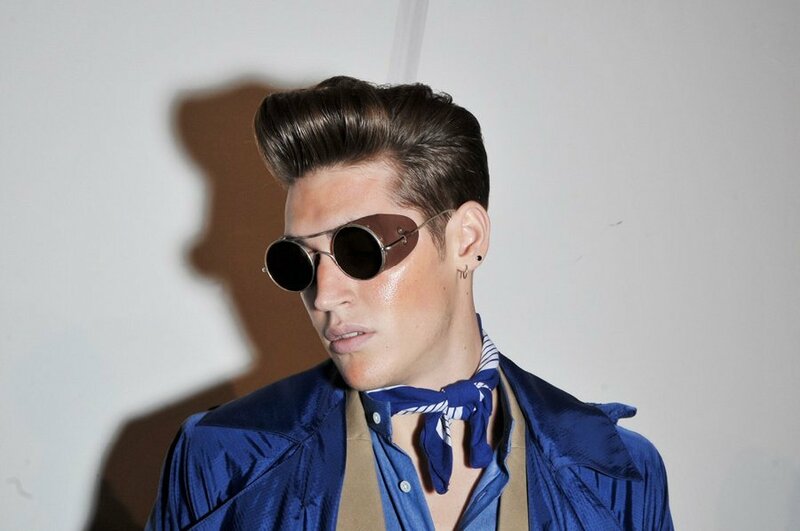 A details obsessive, Carolyn Massey is known for her quintessentially elegant English cuts and details as her work concentrates on what it takes to be a modern gentleman. After each collection I frequently nod approvingly and write a gushing review but I also act as a consumer by dipping in to my pocket to invest in a few pieces for myself. For SS10, Carolyn was inspired by the film 'Heroes of Telemark' - a film about heavy water sabotage in WW2 starring a rather tanned Kirk Douglas, along with a late Summer visit to one of Kent's fishing villages Dungeness, her gentleman explores the great outdoors. As a Kentish lad I know all about Dungeness with its quaintly dotted bay of fisherman huts and boats but like my hometown of Margate, Dungeness is an eerie landscape of stark contrasts. The resulting collection collection is in no doubt inspired by spending the so-called warmer months in the great outdoors. The pieces came together to offer protection and function whatever the weather whilst colour, including mustard yellow and rich blues, was splashed throughout to create a collection to truly covet. With each season Massey continues to evolve at apace and here she introduced a mouth watering selection of accessories but it was the outwear that was truly special. If my bank balance had allowed me to I would have invested in the majority of the collection but alas, I had to compromise. 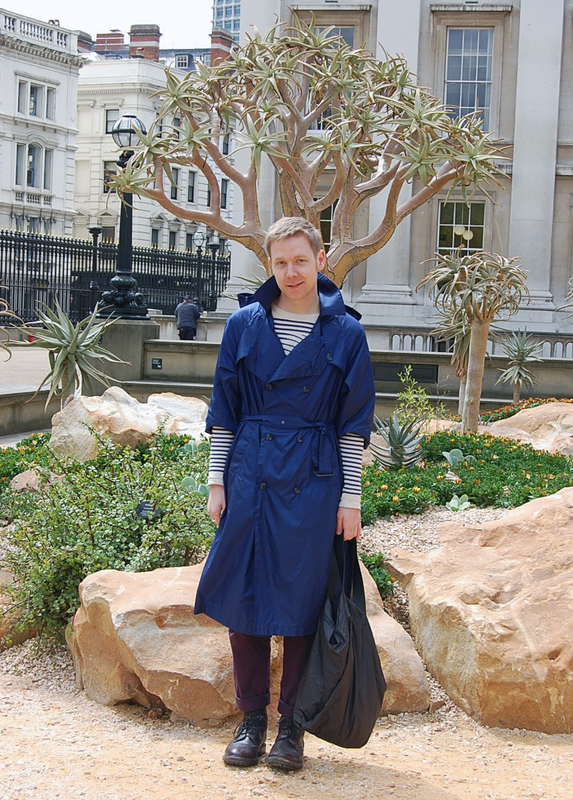 A featherlight trench came in bold blue and for me is the perfect everyday jacket for the season. I just had to order one for myself. If Carolyn can effectively imagine a suave boy from Dungeness, what is stopping a boy from Margate doing the same? Even on the warmest of days in fair Blighty, there is a constant threat of the odd downpour and this coat wonderfully combines function with style. In addition to being extremely well cut, it is the fabric that really makes this trench special, rip stop nylon. Rip-stop nylon is a light-weight nylon fabric with inter-woven ripstop reinforcement threads in a crosshatch pattern. It was originally developed as an inexpensive synthetic replacement for silk in the production of parachutes during World War II. Today, the fabric is often used in yachts for sails and spinnakers, hot air balloons, kites, parachutes, camping equipment such as lightweight tents and sleeping bags, flags, banners, to name but a few applications..not to mention a long coat. My quest for the perfect lightweight Spring/Summer jacket is over. Forget the boys from Dungeness, I am Massey's boy from Margate. This well cut long coat in parachute fabric marries function with style to become my ideal coat for Spring/Summer. That is one nice coat! Just seen the cagoule on Selectism but I prefer your item. I just came across your blog, and I really like it! 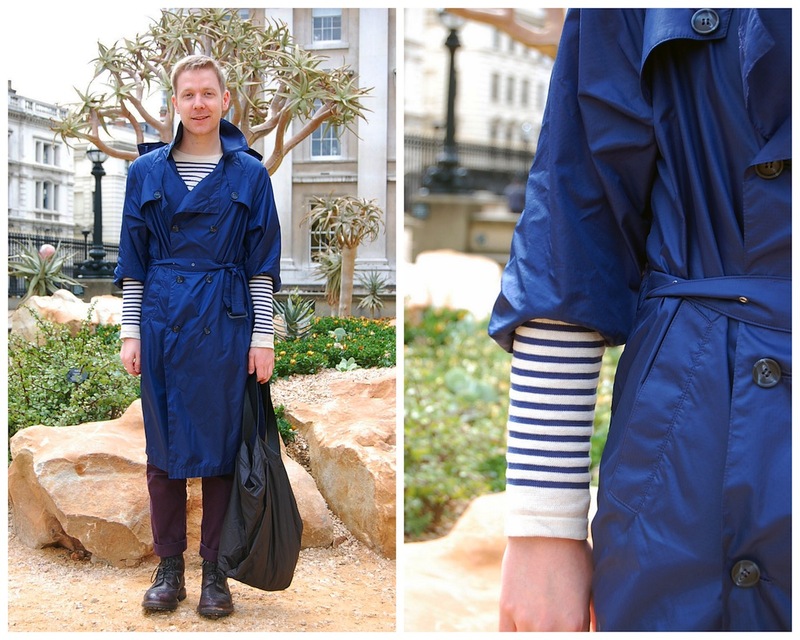 The short-sleeved trench and the stripes together are fantastic here! that trench is to die for! the fabric blueness of it all. Good move on the coat purchase. It is so bold! I am a big fan of blue and white stripes so I basically like your whole outfit today. I like the idea of pairing it with a stripes long sleeves! It is really cute and fab! and I must say that the coat really looks good on you. La Historiadora de Moda, Zoku, Joy, Kay: Thanks all! Anastasia and Duck: Oh my styling fooled you, the coat is in fact long sleeve. I've just rolled them up here because I wanted to show off the stripes. I'm interning for Carolyn for September Fashion Week; very excited indeed to be working with her, the coats are crisp and exceptional.